Concertino is YOBC’s second string ensemble in the junior division. 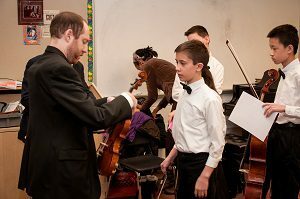 It is geared toward middle school students who have been studying their instruments for at least two years and who have previously participated in either their school orchestra or Prima Strings at YOBC. Concertino’s objectives include the continued development of players’ ensemble technique and the ongoing improvement of each student’s individual instrumental technique. Ensemble skills to be emphasized include watching and responding to the conductor, listening to the other players in the orchestra (ensemble awareness), and attending to one’s own playing in the context of a group. Concepts such as syncopation, intonation, musicality, and dynamic and tempo changes are frequently included in repertoire chosen specifically to challenge students’ abilities and prepare them for the major repertoire demanded by upper level ensembles.